Small but mighty! Have a small kitchen? Don’t have many mouths to feed? The Mini Kitchen Cooker gives you a compact 28 litres of space, but still has enough room to roast a chicken perfectly. It’s ideal for student accommodation, a small flat or for those living by themselves, as it is also very cheap to run. 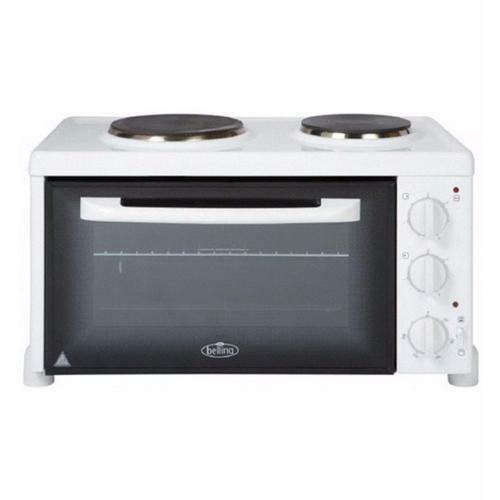 For versatility in your cooking methods, this model also has an electric grill and a twin solid plate hob too, giving you the flexibility to cook all sorts of dishes. Comes complete with a 13a UK 3 Pin Plug top fitted, ready to be plugged into a mains socket. My daughter is going to college, she is staying in student accomadation, i would like to get her a facility so she can cook in her own room. Will this work on the wiring that's in the university accomodation? Electrical World Replies: Thanks for question, there is no reason if there is a 13amp socket that this wouldnt work. The cooker comes with a 13 amp plugtop already fitted. Unless the college has a policy on no cooking in the room etc this will work great for your daughter.